"S. W. Mac KECHNIE & SONS"
Jacques Fauvelle sent me informations: The S at buttom of the bottle is for SILAS (the father) and the W is for WYMAN (the village name). The "SONS" still alive and their names are Ronald (78 years old), Douglas et Laurie. The family farm is own by the grandson Ian (41 years old). 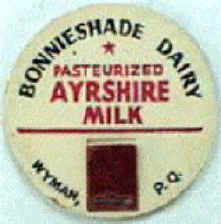 This dairy operated from 1932 to 1959. Source: "Ronald" the oldest son. He should be met again by Jacques Fauvelle.